Herbicide tolerant crops currently available in Canada have been designed as a way to simplify and improve the performance of herbicide-based weed control programs. There are also claims that use of herbicide tolerant crops allows farmers to reduce herbicide use. 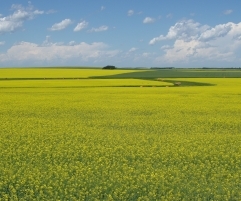 The development of herbicide tolerant canola has certainly allowed western Canadian farmers to simplify their chemical weed control programs, and in some cases, reduce herbicide use. Whereas broadleaved weed control in canola was previously very difficult, canola is now considered to be a “clean-up crop” (O’Donovan and Maurice, 2007). The excellent weed control obtained with in-crop Roundup® on Roundup Ready® canola can allow for reduced herbicide use in the following crop (Nazarko et al., 2005). The introduction of herbicide tolerant canola has also reduced dependence on Group 1 and Group 2 herbicides, allowing for better control of weeds that have developed resistance to these chemicals (O’Donovan and Maurice, 2007). While the benefits of herbicide tolerant crops to the cropping system are important, consideration of long-term implications is also essential. As with any weed control practice, overuse of herbicide tolerant crops can result in heavy selection pressure that allows weeds to become adapted to the system. For example, overuse of glyphosate tolerant soybean in the United States has resulted in the selection of glyphosate-resistant weeds, and a shift in weed communities toward species that are more tolerant of glyphosate (Nazarko et al., 2005). Control of volunteers of herbicide tolerant crops can also be problematic. There is evidence that the presence of Roundup Ready® trait in canola is causing additional herbicides to be required in zero-tillage systems in western Canada (cited in Nazarko et al., 2005). Introduction of other Roundup Ready® crops such as wheat and alfalfa would further complicate weed control options. Herbicide tolerant crops can provide benefits to the crop production system, but should be used in conjunction with other weed and crop management practices. Integrated weed management principles should also be applied to use of herbicide tolerant crops. For example, rotating between herbicide tolerant systems (i.e. Roundup Ready® vs. Liberty Link®) is advisable (O’Donovan et al., 2007). Herbicide tolerant crops can offer opportunities for simple and effective weed control in crops such as canola. Overuse of herbicide tolerant crops can select for weeds and weed communities that are resistant to the herbicide used in-crop. Controlling volunteers of herbicide tolerant crops can be problematic. Use of herbicide tolerant crops should be integrated with other weed management practices. O’Donovan, J., and D. Maurice. 2007. Weed management is not what it used to be! Proceedings FarmTech 2007, Edmonton, AB.